A huge crowd turned up at Westlake Boys' High on Sunday evening to hear Michael Palin talk about his latest book, based on the new TV programme, The New Europe. Palin was his usual charming and entertaining self, genuinely liking his audience and eager to aswer their questions. 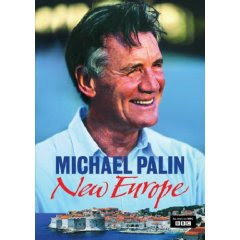 Finlay McDonald was a skilled interviewer and did an elegant introduction and had clearly done his homework when he read an entry from Palin's Diaries (The Python Years) when Palin mused some time in the 1970s that surely there would one day be "more countries in Europe". Footnote - New Europe was reviewed by Bookman Beattie last week and his review can be read here.